A single, comprehensive exhibition occupying both the Piano Nobile and the Strozzina will immerse you in space, music and sound as you track the career of this artist from his early experimental work in the 1970s right up to his monumental installations of the 21st century. Exploring spirituality, experience and perception, Viola probes humanity: people, bodies and faces are the leading players in his work with its poetic and strongly symbolic style in which man interacts with the forces and energies of nature such as water and fire, light and dark, the cycle of life and the cycle of rebirth. 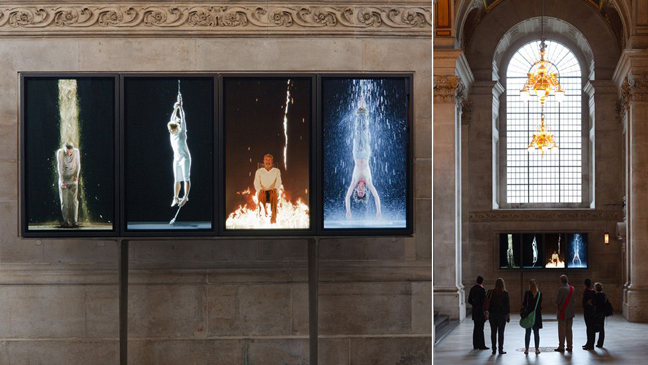 Thus the exhibition is a celebration of Bill Viola’s special relationship with Florence, where his career in video art began when he was technical director of art/tapes/22, a video production and documentation centre, from 1974 to 1976. His bond with Tuscan history and art is further enhanced by the exhibition’s intense interaction with such museums and institutions as the Grande Museo del Duomo, the Gallerie degli Uffizi and the Museo di Santa Maria Novella in Florence, as well as with the cities of Empoli and Arezzo.